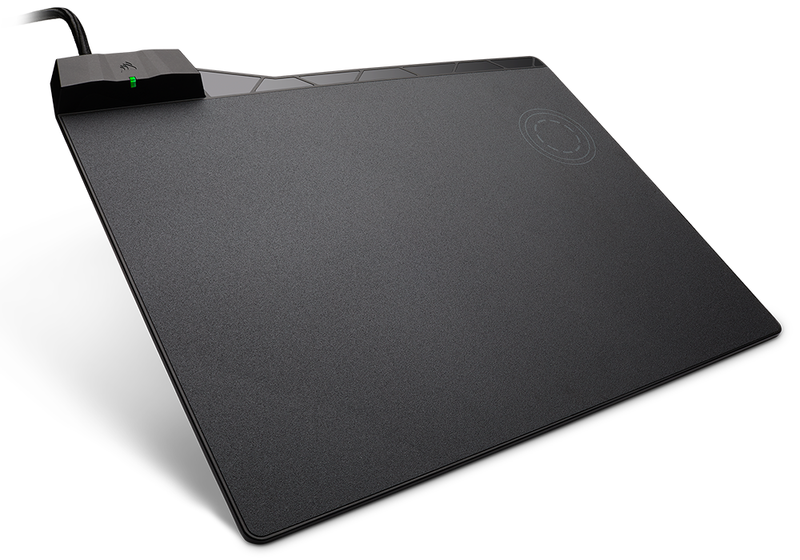 If the thought of spending £100 on a mouse hasn't scared you, then you may also want to consider the Dark Core RGB SE's optional counterpart, the MM1000 Wireless Charging Mouse Pad. Available as an £80 accessory, or a £175 bundle when purchased with the mouse, MM1000 brings something new to table in the form of an integrated Qi charging point. The concept is simple enough, and in practise the basic functions work quite well. The mouse pad connects to two USB 3.0 ports on the host PC via a split 1.8m braided cable, and when Dark Core RGB SE is running low, simply place it on the highlighted spot and hey presto, it'll begin charging. 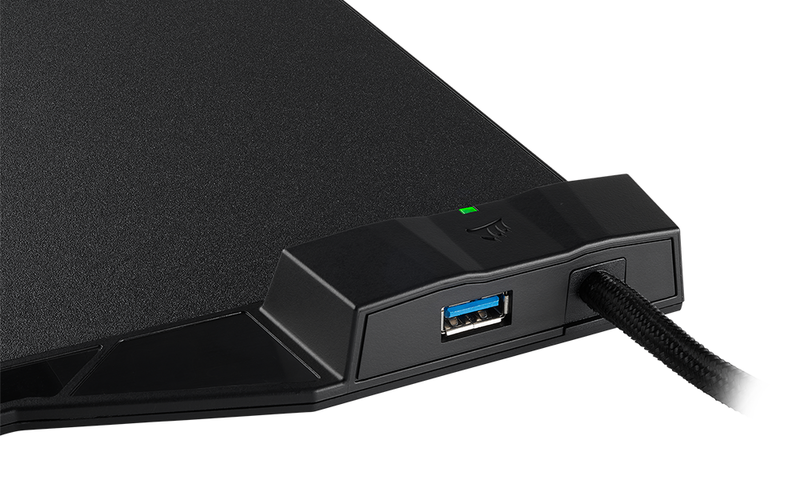 It's a neat trick and MM1000 also includes a single-port USB 3.0 hub that does come in handy. But there are a few limitations and quirks to be aware of. At the time of writing, there's only one size available - 260mm x 350mm x 5mm - which while reasonably roomy isn't as spacious as some might like, and a hard textured surface is the only choice of finish. I've never been particularly fond of hard mouse pads, and the noise of Dark Core RGB's PTFE feet sliding around the surface is off-putting. At some point in the future, we imagine the whole surface will be a charging plate that keeps the mouse topped-up at all times, but the current implementation isn't perfect. You lose the ability to charge if your PC's USB ports go to sleep, the green charging status LED is surprisingly cheap-looking for a manufacturer with RGB expertise, and though the Qi charging point can be used with various devices, your mileage may vary. We've found the surface feels a tad cramped to use while a phone is charging, and Corsair's bundled charging receiver is a bit of a mystery, too. Shipped with a choice of USB, Type-C or Lightning adapters, the theory is that you plug the Qi receiver into your device and then place it on the charging point. But if you're going to plug something in, why not just resort to the tried-and-trusted mains cable? 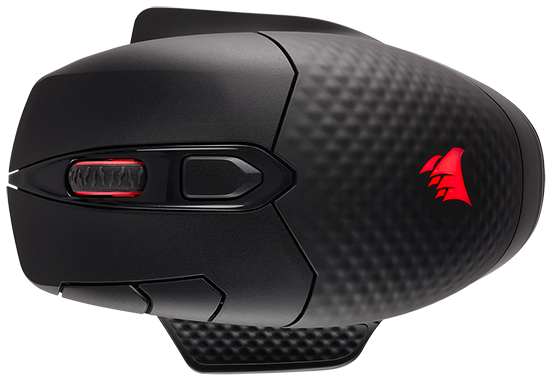 We like the fact that MM1000's rubberised base keeps it planted, but right now it is little more than a very expensive method of charging a compatible mouse. ...a precise optical sensor, nine programmable buttons and, of course, the ability to connect via your choice of USB, 2.4GHz or Bluetooth. 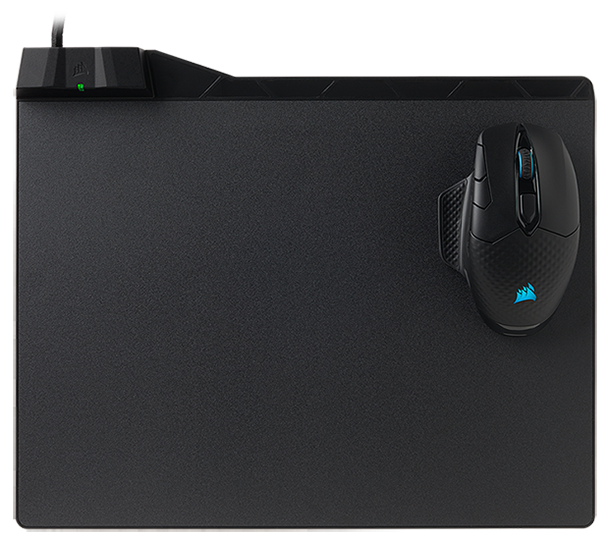 Corsair is calling on gamers to 'unplug and play' with a new range of gaming peripherals promising less clutter, more freedom, and all the performance you would expect from a wired device. The first mouse to emerge from the company's wireless stable is the Dark Core RGB. Available with or without integrated Qi wireless charging, the pointer's best attributes include a comfortable contoured shape, a precise optical sensor, nine programmable buttons and, of course, the ability to connect via your choice of USB, 2.4GHz or Bluetooth. A solid first outing with impressive real-world performance, however there is room for improvement. The gamer-orientated aesthetic is an acquired taste, the £100 price tag attached to the SE model is steep, and the optional MM1000 Wireless Charging Mouse Pad is an expensive accessory whose promise is curtailed by a few usability quirks. Bottom line: Dark Core RGB is a capable wireless gaming mouse, but Qi wireless charging in our estimation isn't worth the extra outlay. The Corsair Dark Core RGB SE is available to purchase from Scan Computers. why buy a wireless mouse without a charging pad ? why not have charging coils all over the pad ? why so much … ? Because it looks cool and single-colour lights are SO last season, dahling. >why buy a wireless mouse without a charging pad ? Because it's £15 cheaper and doesn't tie you to that particular mat. >why not have charging coils all over the pad ? Based on commnts about how and how well it works so far, additional coils won't be anything special… just more expensive and hogging all your USBs. >why so much … ? So much what? Money? Because so many people have so much disposable income. The real question is why so few buttons, still? £80 for a largely useless mouse mat. A-ha-ha-ha. Ha-ha-ha-ha. Oh my sides! If you could use the mouse while it changed on the mat I could understand this, but this idea is just a useless gimmick. Why micro-USB at the mouse end and not USB-C? And just use AA batteries so they can be quickly interchanged if needs be like my Performance MX has rather than what's presumably a non-interchangable propriety battery (the mouse dies when the battery dies)? So many needless compromises. I'd much rather stick with a wired mouse. Wireless headset is useful, but mouse? 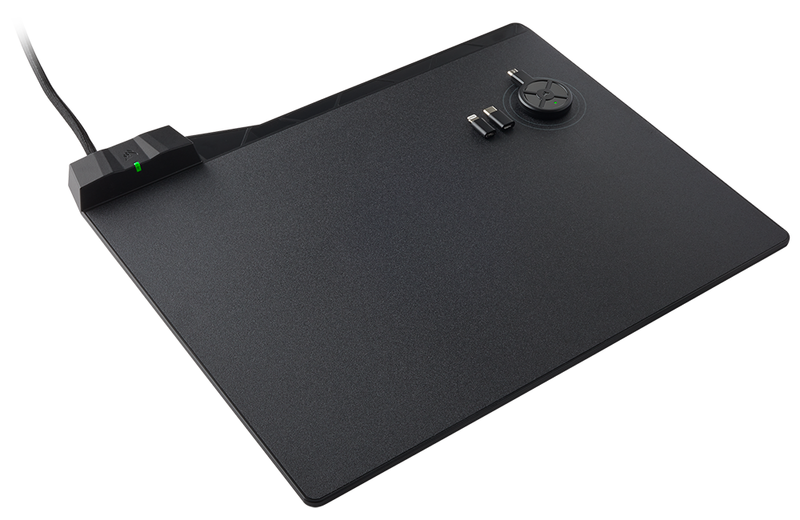 I'm using the Logitech G903 with the Logitech PowerPlay mousemat. £260 MSRP. But it won't charge anything but my mouse. At least this can be used to charge anything Qi enabled. Getting rid of the wires is lovely though. Especially when you then don't need to consider ever charging it. It gives the mouse a real sense of freedom. I can lie stuff anywhere I like on my desk without ever needing to fret about what I might bump into or move.